A successful partnership with CSIRO and the GP SUPERCLINIC Midland Railway Workshops has come to fruition. GP SUPERCLINIC Midland Railway Workshops is super excited and honoured in announcing the accomplishment of a world First Pilot trial of diagnostic application of Artificial Intelligence in detecting Diabetic Retinopathy using ground breaking technology. We are extremely proud of this partnership, which is a testament to our commitment in empowering GP and Primary Health Care sector in addressing and combating community health matters more proactively and efficiently. The technology’s creator and trial co-lead, CSIRO’s Professor Yogi Kanagasingam, said the innovation could help people with diabetic retinopathy receive treatment faster. “Early detection and intervention for diabetic retinopathy is key, and this new tool is the first step to help GPs prioritise patients for treatment,” Professor Kanagasingam said. “Patients at risk of this condition would usually be referred to a specialist for screening, waiting six weeks or more – now it can potentially be done in a single 30-minute visit to a GP,” he said. 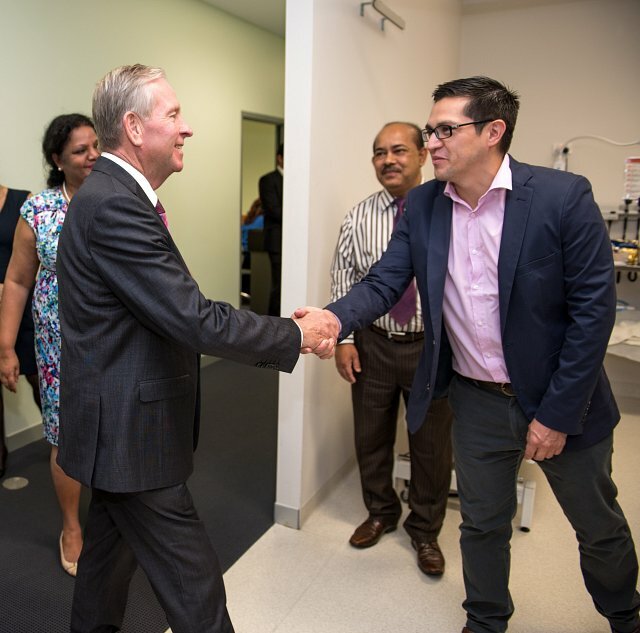 Director of the GP Superclinic at Midland Railway Workshops and trial co-leader Dr Amitha Preetham said: “Industry-wide and multi-sector support for the uptake of medical technologies in primary care is an important step in improving health outcomes for our communities. The artificially intelligent grading software, affectionately named Dr Grader, was developed by researchers at CSIRO. By analyzing ophthalmologists’ grading data, Dr Grader was able to improve its ability to detect various signs of the disease in patients. Using the technology, GPs will be able to screen patients for signs of the condition and its severity, and refer them to an ophthalmologist for further investigation, prioritised by the severity of their symptoms. 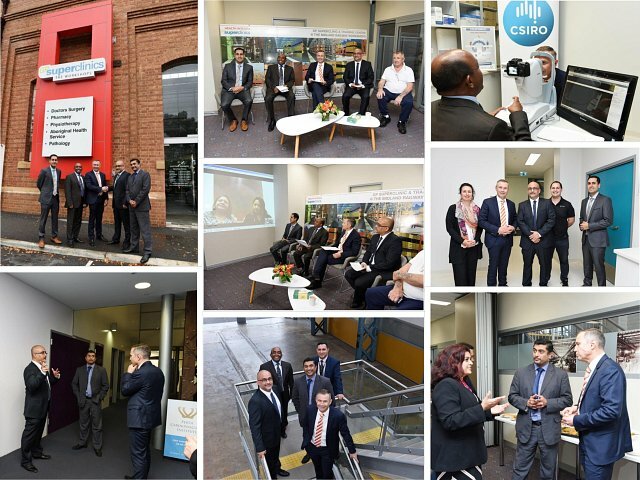 We were privileged to host Deputy Premier and Health Minister - Honourable Minister Roger Cook at the GP SUPERCLINIC Midland Railway Workshops on 11th September 2017 to announce this great achievement. New artificial intelligence-driven technology has been used to screen patients for diabetic retinopathy in just seconds at a GP clinic, without the need for an ophthalmologist. The world-first technique, developed through the CSIRO, will make it easier to detect the cause of blindness in the more than 1 million Australians living with diabetes. CSIRO Professor Yogi Kanagasingam said it was not possible for eye specialists to keep up with the growing numbers of diabetics. "There are about 1.7 million diabetics in Australia and about half a million don't know they are diabetic. All together there are around 450 million people [worldwide], so it is huge," he said. "There aren't enough eye doctors to screen 450 million people, so we need some alternative methods to find those that need treatment and surgery." Professor Kanagasingam said a diagnosis was generated quickly using the new technology. 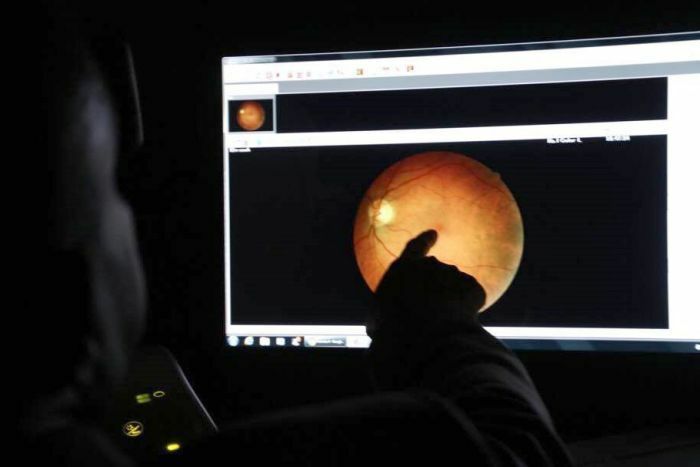 "Somebody takes photos of the retina and then the photos will be analysed by the artificial intelligence system, and then within 30 seconds it will give a reply back to whether or not the patient has to be referred," Professor Kanagasingam said. "It will also tell what kind of disease grading, [whether] mild, moderate or severe." Diabetic retinopathy affects one in three people living with diabetes, and it can lead to blindness. PHOTO: The screening allows GPs to look at the back of the eye to see if there is any damage to the retina. "Usually if a diabetic is at risk of the condition, their GP will refer them to a specialist to have their eyes tested," Professor Kanagasingam said. "Patients wait six weeks to three months to see an ophthalmologist. Most of the patients will not have the disease, so it is an unnecessary waiting." Adam Ireland took part in a trial of the technology and said it was very convenient for patients. "There are so many things that can happen to a human being when you've got diabetes, but a great deal of people who have got it don't realise how dangerous it is," he said. "I found out through my wife, I had the test and it was fine, it was easy." Professor Kanagasingam said the new screening technology streamlined health and preventative services. "We are bringing it to the primary service level ... only thing they [GPs] don't do is eye screening ... but now you are getting the care on the spot." The technology will be rolled out to 20 clinics in Western Australia in the next few months before expanding across the country. In a world first, Perth people with diabetes will have their eyes tested by GPs rather than having to go to a specialist. Using CSIRO technology, doctors will be able to screen the eyes of people with diabetes and potentially treat diabetic retinopathy before it develops into blindness. Announced on World Diabetes Day yesterday, the trial will be the first time that GP-led telehealth screening for the eye condition has been carried out in a metropolitan area. Trial leader Yogi Kanagasingam said one in three people with diabetes was living with diabetic retinopathy. Vision loss or blindness caused by the condition could often be prevented through early detection and treatment. “GPs are the frontline in managing chronic disease such as diabetes,” Professor Kanagasingam said. “If we can pick up early changes and provide the appropriate intervention, we can prevent blindness,” Professor Kanagasingam said. 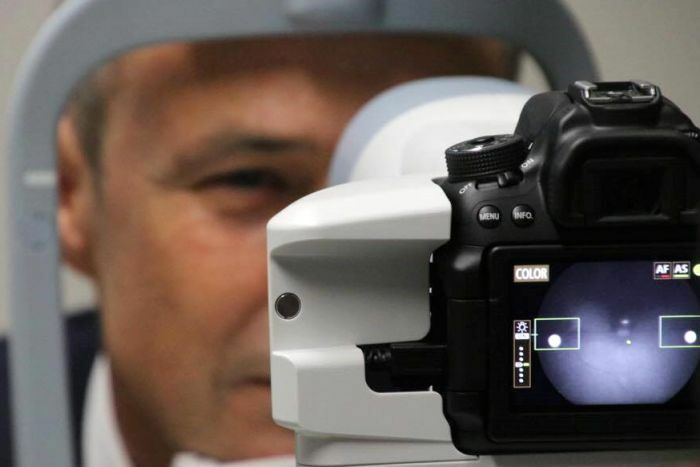 During the trial, which will take place at the GP Superclinic at the Midland Railway Workshops, GPs will capture high-resolution images of a patient’s retina before uploading them to a cloud-based system where they can be viewed by a specialist. CSIRO scientists will also process the retinal images using their software to grade the images for diabetic retinopathy and alert the GP to patients who need referrals. It is expected to reduce the need for people to go to hospital. The trial will screen 200 diabetes patients in six months. 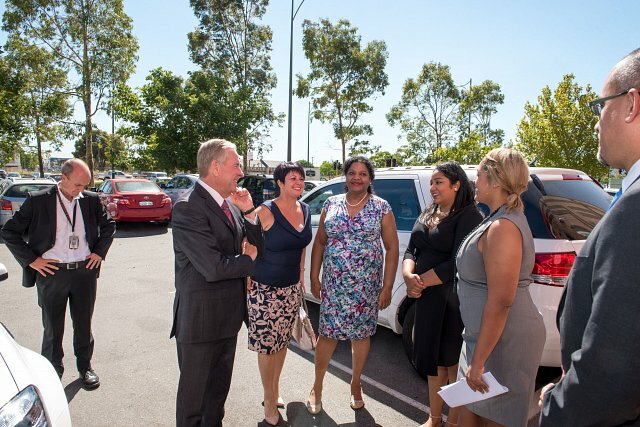 GP Superclinic @ Midland Railway Workshops was privileged to host West Australian Premier the Honorable Colin Barnett accompanied by the Honorable Alyssa Hayden MLA and the Deputy Mayor of the City of Swan Mr David Lucas at the Centre today. 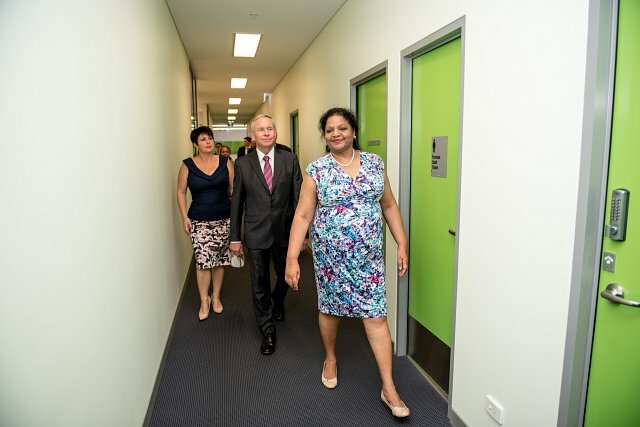 Commencing with a tour of the facilities and introduction to the array of onsite services, the Premier met the members of the multidisciplinary team. 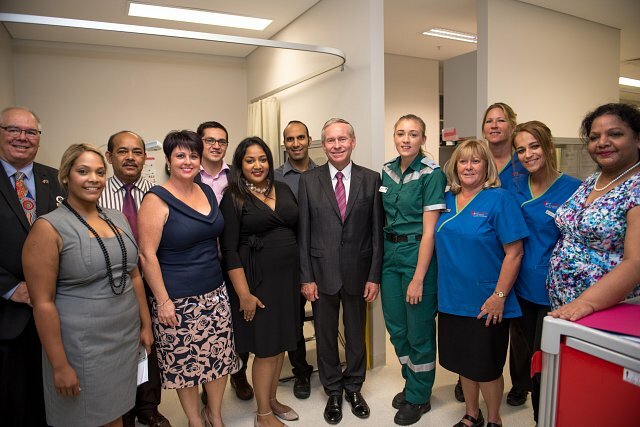 Premier Colin Barnett said the Superclinic was a fantastic service to the local community, providing a one-stop-shop for health needs to residents “Together with the St John of God Midland Public Hospital, residents in Perth’s eastern corridor have some of the best health facilities in the State,” Mr Barnett said. “Utilizing the skills and knowledge of a multi disciplinary team on site and via Telehealth our clinic’s focus is on providing seamless health care to Midland and its surrounding communities. We work with the Midland hospital to avoid presentations to the Emergency Department of conditions that are best managed at the Centre .” said Dr Vasantha Preetham, Managing Director. “Additionally, the Superclinic has broken down barriers impeding specialist integration into the primary care setting and hosts many specialties on site to improve access to these services in the community”. All the above form a robust platform to innovate education of the future primary care workforce such as trainee nurses, doctors, and paramedics who train at the Centre. A baby on his way into the world could not wait until his panicked parents made it to Swan District Hospital so he was born at the GP Superclinic in Midland, minutes after his grandmother swerved into the car park. 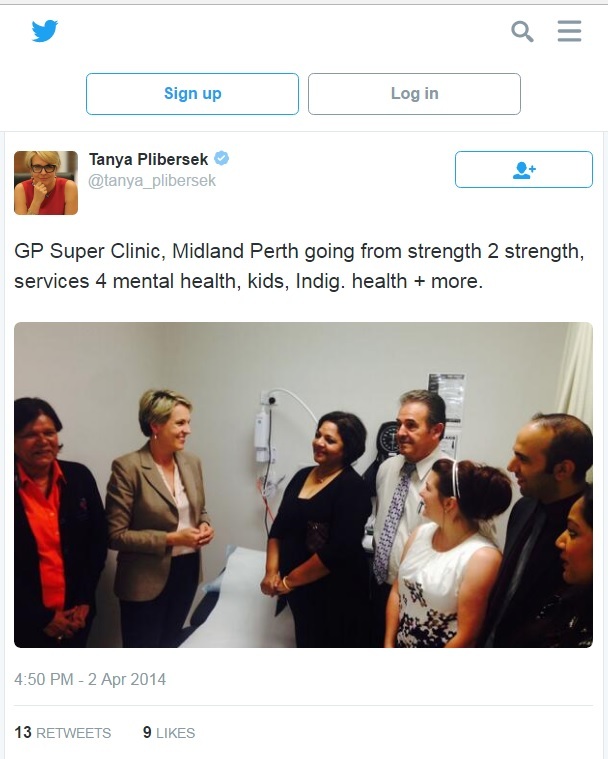 Grandmother Danielle Penny burst through the doors of the GP Superclinic and told staff her daughter-in-law Brooke was about to have a baby. Clinic staff sprung into action helping Brooke through the door and into the nurse’s bay. At that time in the morning, there was only one doctor on and although she had never delivered a baby before she knew what to do. On duty nurse Sandra Whitehead recalled it was a mad dash when she came into work that morning. Ms Whitehead said she just had time to throw her bags down and by the time she ran down the corridor the baby was well on its way. “It was just amazing,” she said. “We kept it nice and calm. “The contractions were instant and the next moment he was born – it all happened within a few minutes. Reflecting back on the hasty delivery Ms Whitehead said at the time she just snapped into it. Mrs Penny said she really thought there was no rush when her daughter-in-law Brook first started going into labour at around 7.30am. So she had a shower and took her time getting ready. But by the time the family from Byford, which is located past Armadale, jumped into the car and headed towards Midland it was a very different story. Brooke suddenly became very vocal and when they neared the Great Eastern Hwy bypass Mrs Penny said she knew Brook’s contractions were getting stronger. “To make matters worse, up ahead there was a huge house getting hauled by a big truck and I just knew I couldn’t get stuck behind that so I flew down Clayton St,” she said. To add to the confusion, panicked dad Brodie Penny said he jumped on his phone to ring an ambulance, but when the operator asked for an address, he was unable to give one. “I had no idea where I was and I was trying to tell them it was behind the new hospital and they still had no idea. “So I threw the phone at the receptionist who helped me out. Brooks delivery was text brook perfect said Ms Whitehead but she was in shock afterwards. “It definitely was out there,” recalled Brooke. “I practically had to be carried into the clinic, and I somehow got the will power to get up and get in. Boston Colin Penny was born at 8.58am, weighing in at seven pounds and 13 ounces. According to St John Ambulance Western Australia (SJA), there were 79 cases where a baby was born before the ambulance made it to hospital, during June 2014- June 2015. This figure included births at private homes and in the back of an ambulance. In June this year, SJA delivered and cared for 10 newborns, making it the busiest month over the year. A St John Ambulance spokesperson said all SJA paramedics were trained in childbirth. The ambulances also carry a birthing kit and advanced lifesaving equipment that might be needed on the job if a patient begins childbirth. Despite the chaos surrounding his dramatic birth Mrs Penny said her grandson Boston was a very good sleeper and a perfect baby. Planning Minister John Day today announced approval of a new Super GP Clinic for Midland, expected to be operational by early 2012. “The clinic will provide a ‘one-stop shop’ for services that include general practice care; chronic disease management; allied health; diagnostic services and community-based specialist services, with the aim of reducing the need for hospital visits,” Mr Day said. The clinic, one of three designated for metropolitan Perth, will be located within one of the heritage-listed railway workshop buildings on the former Midland railway workshops site. “While the new building will be a state-of-the art facility, it has been cleverly designed to sleeve into the eastern end of the former railway workshop, known historically as Block One,” Mr Day said. “I am very pleased that these magnificent buildings can be adapted and re-used while their heritage is retained and protected. The Minister said the location of the clinic would bring significant benefits to the region. “This is a great outcome for communities throughout the eastern corridor of Perth, the Wheatbelt and Goldfields, who use Midland as their primary service centre,” he said. “As well as offering an exceptional service, the clinic will also generate employment opportunities, with an extensive team of doctors, specialists and allied health professionals expected to be employed within the clinic.